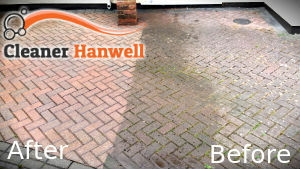 Our company has made hundreds of customers happy thanks to the affordable, yet high-quality jet washing services we provide in Hanwell, W7 and the surrounding areas. The secret to our success is quite simple – we are detail-oriented and passionate about our work, charge decent prices, and employ the latest equipment and pressure washers to ensure your patio, driveway, decking, fence panels or exterior paved areas always look at their best. Don’t believe us? Give us a call and we guarantee the results will exceed your wildest expectations! The technicians we employ are specially trained to handle the cutting edge equipment and high-pressure washing machines, used in the process of cleaning your outdoor areas. The great thing about jet washing is that it is proven to be effective on all types of outdoor surfaces, so it matters not whether you need your brick fence, patio, wooden deck or driveway cleaned – in all cases, we guarantee you will be impressed with the final results. The technicians will first evaluate your property and determine what water temperature should be used on this particular surface. The idea is to prevent damages on the surfaces being cleaned. This is what enables our team to effectively clean any type of stains from your driveway or paved area, including oil and chemical residue. The same is valid for moss, algae and weed that plague your brick fence or paved areas. 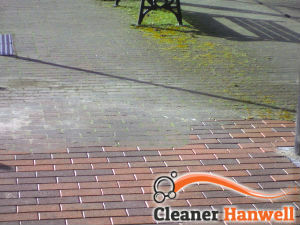 If you demand excellent results and quality at budget-friendly rates, book our jet washing services in Hanwell. We are at customers’ disposal throughout the week and are available for appointments and free quotes over the phone or via our website. Make the right decision and call us today!